These windows complement any style of home and have all the energy-efficient features you want. 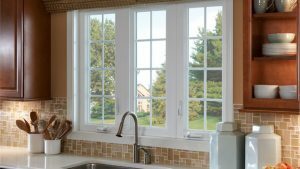 When considering replacement windows for your home, don’t overlook the benefits of high-quality Atlanta casement windows! Though this style often adorns historic houses, these windows look just as great on modern structures, and Tight Line Exteriors carries a full line of replacement casement windows that can enhance the beauty of your home while also saving you money on costly heating and cooling. Effortless Operation: Casement windows are easily opened with one hand, making them a great choice for a spot that is not easy to reach. Enhanced Security: Because there is no way to turn the crank from the exterior of the home, these are one of most secure windows on the market. Excellent Energy Efficiency: Replacement casement windows seal tighter than other types of windows. That translates to better energy efficiency and greater savings on your heating and cooling costs. Better Circulation of Air: Sash windows only allow air to flow through one part of the window, but casement windows let air enter through their entire height, allowing for much better ventilation. Learn more about our casement windows and other quality replacement windows by getting in touch with us today! Give Tight Line Exteriors a call to speak to a member of our team, or simply fill out our online contact form to schedule your free, no-obligation estimate.